They just don't come any nicer than this! 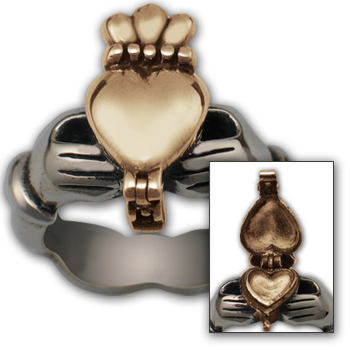 Real Craftsmanship defines this classic Sterling Silver & 14k gold Wave Ring. 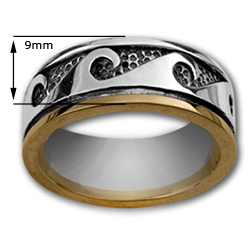 The pattern is continuous in every size, so there is no concern of a "sizing band" rotating around to the front of your finger! Sure to become an everyday favorite, this ring is oxidized to accentuate the detailing. I fell in love with this ring the minute I saw it. I looked at many rings from Overstock.com and rings made from Hawaiian wood. For the money I spend I feel that I have a value. Moonstone was quick to answer my e-mails and assure me that the silver was very sturdy and should not bend as I have had silver rings bend on me in the past. 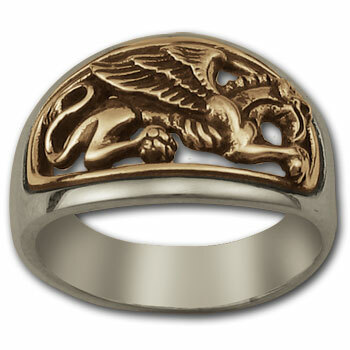 Also the ring looked exactly like the picture as I was worried there might be a variation. Priority Mail was fast! This is now the coolest ring I own. An excellent execution! The gold adds a nice contrast, as does the antiquing. Would recommend in a heartbeat.